0 Lovely Rubies Love hearing from you. 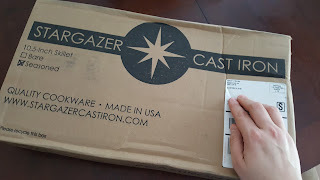 Stargazer Cast Iron - A Review! When I was about fifteen years old, I got a wild hair and decided to help my mom by deep cleaning in the kitchen. 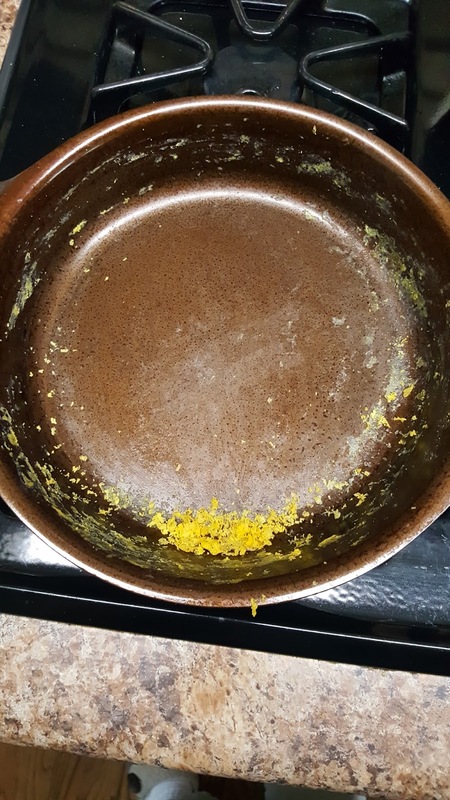 The first thing I tackled was the biggest task I could see...cleaning her cast iron pan! It was caked on THICK and no amount of dish soap or scrubbing worked. So what did I do? I got a flathead screwdriver and a hammer and I began to chisel away that caked on mess! 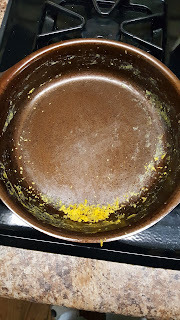 (I can hear the gasps and shudders from those of you who know that I'm talking about years of seasoning here...) HOURS later, I only had half that pan chiseled clean. And, as you'd probably guess, my mom was less than thrilled with my efforts. Thank goodness that I've learned the value of cast iron cookware, a good seasoning, and the proper tools to care for it! (Hint: it does NOT involve a hammer, a screwdriver, or any form of chiseling!) Now my kitchen is outfitted with my late grandmother's stainless steel pots and pans...and my late mother-in-law's large set of cast iron pans! I do not own any of the harmful non-stick pieces anymore. My cast iron is pretty much non-stick! 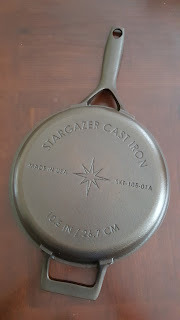 So you can imagine my excitement when I asked Stargazer Cast Iron if they would let me review one of their pans...and they said yes! It took some time for a pan to become available for me (this company is so good--they have had a waiting list! ), but this one was worth the wait! The pan I received is a 10.5 inch, preseasoned pan. It is a beauty! One of my favorite parts is the large handle. It is larger than the handles of all the other cast iron pans I own, and the shape makes it easier to get a good grip when moving it. This is important to me because I have somewhat weak wrists from injuries as a teen and carpal tunnel when pregnant with my children. But with this wide and long handle, I can get a good grip so my wrists do not give out from the heavy weight. There is also a second handle on it for when I need to use both hands to carry it. When I first received my pan, I washed it with hot water and dried it on my gas stovetop. 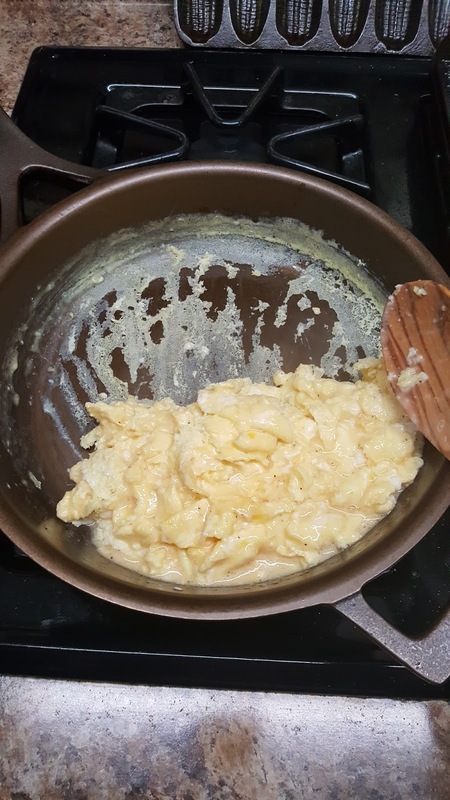 I scrambled some eggs first--and they did stick a little in the center. So I thought I would do what some of their customers said they did--I seasoned it some more! I did three rounds of seasoning in my oven. Unfortunately, I think I may have done it too many times, or left the oil coating too thick before putting in the oven, because my food stuck worse after these seasonings. So, I took my scrub bud and scrubbed it all off under hot water. This made the pan super slick! And guess what? 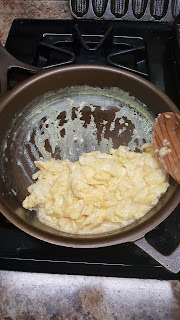 My next batch of scrambled eggs did not stick--at all! There are a few things that make this pan a favorite that I do not want to forget to mention. First, these pans are made right here in the U.S.A.! They are made slightly lighter in weight than competitive companies' products. And their handle is called a "stay cool handle". It will get warm (or even hot after a long time over a gas stove flame), but it stays cooler much longer because of its design! I am usually done cooking in it before it gets too hot for me! I must say that I am so thankful to have had the opportunity to keep this pan in exchange for this honest review! 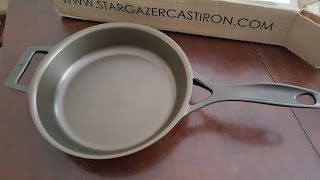 Stargazer Cast Iron has set out to fulfill their vision of "creating the best cast iron cookware around". In my kitchen, they have far surpassed the rest! Look at this beauty! Get your own from Stargazer Cast Iron!